Fiddle, banjo, guitar. What a combination. But then again, I like a lot of different types of music, just so long as it is good. So there was somewhat of a musical surprise when we took the 11-mile one-way trip around Cades Cove in the Great Smoky Mountains. 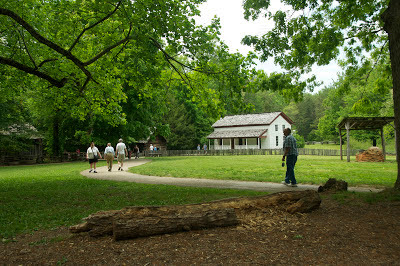 There is a visitors' center about halfway (and also a restroom), that we like to stop and visit whether to look at the various offerings inside the building or to visit the homestead adjacent to it. This time, we came across three park entertainers sitting on the porch of the center, offering up some good bluegrass music. While wifey worked her way around the center and then to the farmstead, I just sat down on one of the seats on the porch and enjoyed their offerings. Others seemed to get an equal amount of enjoyment as the crowd grew and entertainers entertained. It was brief moment, but added a bit of nostalgia and history to such a beautiful place.